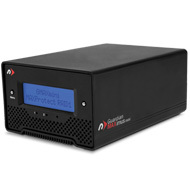 NewerTech Guardian MAXimus storage solution provides maximum Plug-and-Play "Live Activity" data backup and protection in a space-saving mini footprint. 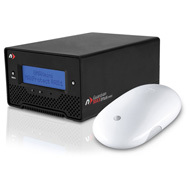 In the pre-configured MAXProtect mode, Guardian MAXimus mini guards against data loss and costly system downtime by writing the same information in real-time to create a "mirrored" copy of up to 2.0TB of data. For those seeking faster performance, Guardian MAXimus mini can be easily switched to MAXPerform mode for up to 4.0TB of high speed performance storage. Whatever your preference, Guardian MAXimus mini offers MAXimum performance, flexibility, and reliability for critical data backup. 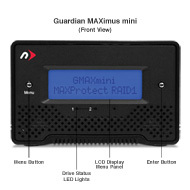 Guardian MAXimus mini is ready to go wherever your "mobile office" needs take you. Bus-powered (no AC adapter required) and weighing as little as 1.24 pounds, it offers maximum data protection with minimal gear bag bulk. 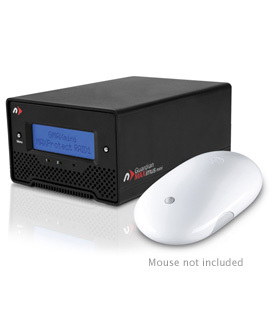 While ultra compact, the Guardian MAXimus mini comes packed with high performance features like dual hard drives or SSDs, data transfer speeds up to 300MB/s, and user conveniences like a front panel LCM screen/control interface for drive and system status monitoring. With the RAID-0 striped mode, Guardian MAXimus mini dedicates its drives to maximum performance ensuring you stay working at the highest speeds. In the RAID-1 mode, you get a "live activity" backup of financial records, medical files, business projects...any critical data that you simply cannot risk losing. You're always protected against data loss as the same information is copied in real-time to two separate drives for a "mirrored" copy. You're also protected from costly system downtime and data restoring after a single hard drive-equipped system crash. By having a second, "mirrored" copy, you can keep working and saving until the failed drive is replaced. Best of all? After replacing that drive, the Guardian MAXimus mini automatically rebuilds the "mirror" by copying all the data to the new drive! UL Listed U.S./International Auto Switching 100 ~ 240v, 50/60Hz input, 12Volt 2 Amp output Power Supply (adapter plugs for International use sold separately). For replacement power supply, click here. 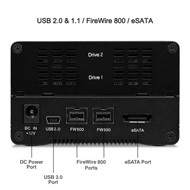 Bus powered via FireWire, or use FireWire for power while using an eSATA connection for data. eSATA: Macintosh with eSATA interface, either built in or via PCI eSATA card. FireWire 800: Macintosh with FireWire 800 interface, either built in or via PCI FireWire 800 card. Windows 2000 or later required for FW800 Operation. UL Listed U.S./International Auto Switching 100 ~ 240v, 50/60Hz input, 12Volt 2 Amp output Power Supply. For replacement power supply, click here. Operation with Apple Thunderbolt to FireWire adapter requires external power supply. Rating: 5/5 Easy-piesy! April 12, 2018 So I see the video and think this will be quick. Then just the trial I had to back out the drive bay screws made me think I would break it. Those screws are tightened way to much! Once the screws were out it was plop, plop, fizz, fizz what a relief it is. I found the area below the unit gets really hot and after a quarter inch spacing it all cooled down. Definitely needs that space! I'm using the MAXImus with two other FW 800 drives and there was no issue with the additional drives. All is well and running great! Rating: 5/5 Excellent, solid and compact. February 4, 2018 This drive may not be as 'designer glam' as other brands, but for a compact, bus-powered 2x2Tb RAID, it is excellent. It runs silently on my desk and can also travel easily when required. Rating: 5/5 Small Form Factor with Great Functionality January 15, 2018 Bought this on a bit of a whim - had a couple of different external drives (Gardian Max and now the Mini) but with the replacement of a couple of drives in laptops, figured it would be a great recycle of these drives. Installs easily and connects quickly to my existing eSATA PCIe card. Probably the only downside is to always remember to eject the drives on shutdown. Bought another for a friend and he's delighted also. Have backed up at least 500MB and found the reliability to be suberp and would be a repeat buyer. Rating: 5/5 Great little RAID drive for Mac backup December 1, 2017 This is a fantastic RAID solution for backing up your Mac. All metal construction, simple to install and very easy to change out a drive it one should fail. Way better solution than a standard desktop external drive. Rating: 5/5 Wonderful little device September 11, 2017 I have bought this kit in order to reuse two HDDs that became freed up after upgrading the data storage in my vintage MBP 17s to SDDs. The GMAX mini kit is super-easy to populate with disks and put to service (you need no more than 2 minutes) and extremely handy and useful, especially when used with FIreWire, which provides enough power for use without the external power supply that also comes with the kit. I had an issue with the LCD in my particular kit. After taking a picture of the display and e-mailing it to the OWC customer service, a replacement kit was briskly sent to me. The service was exemplary: Very understanding and helpful, polite and totally hassle-free. Without exaggeration, this was by far the best customer service that I have experienced in the last 20 years. Rating: 5/5 Excellent product for everybody who loves FireWire July 25, 2017 To my knowledge, this is the only product of its kind that maximizes the utility of FireWire's capability to power external devices: two 2.5" disks in the RAID-0 or -1 configuration, all bus-powered. The fact that no external power supply is needed when powered by FireWire makes the device extremely handy and useful -- I find myself taking MAXimus mini around even where I would not have expected it. In summary, MAXimus mini is a wonderful little device worth every penny. Rating: 5/5 Excellent June 20, 2015 Absolutely trouble free. Hopefully a USB3-C version is on the way. I would recommend this item to a friend! This review is from 2.0TB NewerTech Guardian MAXimus mini Portable 5400RPM FW800&400 +USB2+eSATA Storage Solution. Rating: 5/5 Great little raid drive. April 10, 2015 Great little raid drive, easy to use, already configured for max protect ready to go. I connected it to my Time Capsule and I use it for storing information that I want to access with my iPad and iPhone using the program file browser, so I do not have to leave my computer on all the time. This drive goes to sleep when it is not needed. Rating: 5/5 Excellent Drive June 28, 2014 This RAID 1 drive is better and faster than the internal dual Mac Mini drives and it is bus powered. It has saved the day for my server needs. I would recommend this item to a friend! This review is from 2.0TB NewerTech Guardian MAXimus mini Portable 7200RPM FW800&400 +USB2+eSATA Storage Solution. Rating: 5/5 Perfect portable companion for MacBook Pro October 26, 2011 I took my GMAX mini with me on a 12,000 mile cross country motorcycle ride this last summer for extra storage for my photo/videos documenting my trip. The GMAX mini worked great. I love that it is Bus powered from the Firewire 800 port, so I only needed a single cable to plug it into my MacBook Pro and it would turn on and I could offload my multiple camera's SD cards to it. Data redundancy is a personal requirement of mine, and the NewerTech Guardian MAXimus line gives that to me with all my external storage. The mini is the perfect travel companion piece to the desktop line. 1. The actual total capacity will depend on your own defined file settings/preferences. 1GB = 1,000,000,000 bytes. Total accessible capacity. varies depending upon operating environment (typically 5-10% less). The above capacity specifications are based on the factory default configuration of RAID 1. If the RAID 0 configuration is set, capacities are doubled.